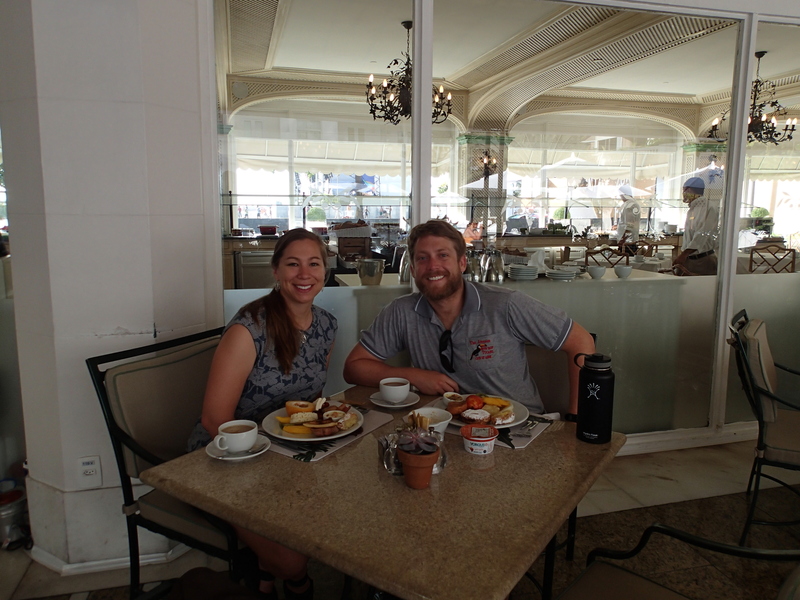 For the first post in my Brazil Travel series, we’re going to talk about lodgings. If you missed yesterday’s intro post, you can check that out here. These are the places we stayed: A resort, a hostel, a palace, and a guestroom. As mentioned, we also stayed on a boat for a week, but that’s a post for another day. I didn’t take this photo, but it gives you a sense of the amazing location. What a fantastic way to end 22 hours of travel (three flights, each with layovers that required us to exit the terminal and go through security again at a new part of the airport. Not fun. I’m calling you out, Miami and Brasilia!). Everything was reasonably priced and they do mean “resort.” Three restaurants, two bars, tennis courts, massive swimming pool, private beach, and a mini-mall on site. This place even has its own zoo! If you ever end up in Manaus, stay here. Just don’t use the taxis parked out front. Once in Rio de Janeiro, we quickly realized that the Manaus resort taxis were probably charging 3x what the city taxis would have cost. 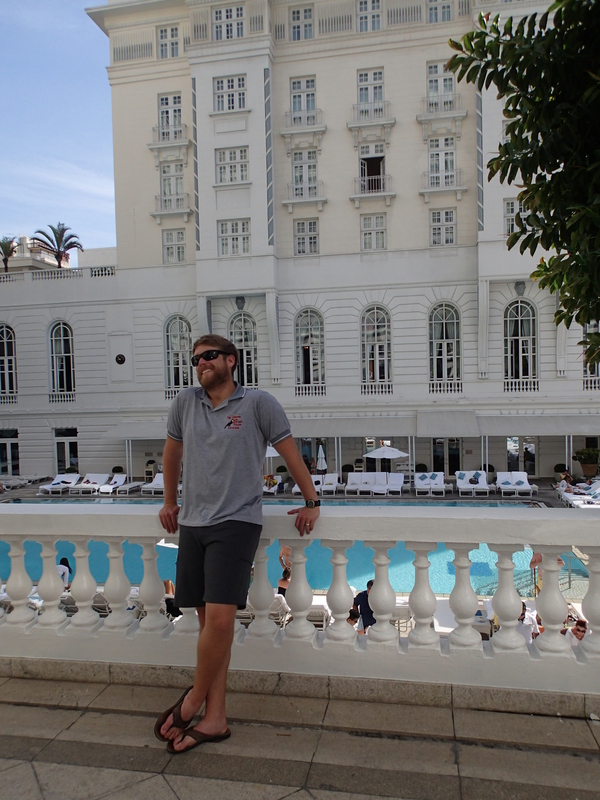 Because we stayed in Rio from December 26th through the 31st (one of the most popular travel times in Brazil, matching up the holidays with summer in the southern hemisphere) the hotel situation was rather difficult. I wanted to stay where “you” stay in MURDERED, and I managed this to a point, but we couldn’t stay there the whole time due to the location’s massive popularity. We were forced to move around, which ended up being a lot of fun once we embraced it. Here’s where your American tourist character is staying with friends at the start of the book. Back when I was doing research, I picked this location because it’s a popular spot for young, unattached travelers, and it’s a location in the thick of things. It’s also recommended in the Lonely Planet tourist guidebook I consulted, so it seemed likely your character might have done the same. As you can see in the hostel’s Facebook post above, I told the staff that I wrote a book featuring their location and they were very appreciative. The manager didn’t believe me at first, but once I showed him in the text, he flipped out. In a great way. He started off by showing all the workers on duty, then he moved on to showing all the guests who were present in the main lounge. That skin tone is due in part to the tropical heat, but mostly because it was a little embarrassing. “Behind the scenes” of that facebook post. In addition to the photos and handshakes, I left a signed copy of the book at the hostel too. The hostel itself does what it says on the tin, and they’re quite good at it. They host events that change every day, ranging from parties to sight seeing. 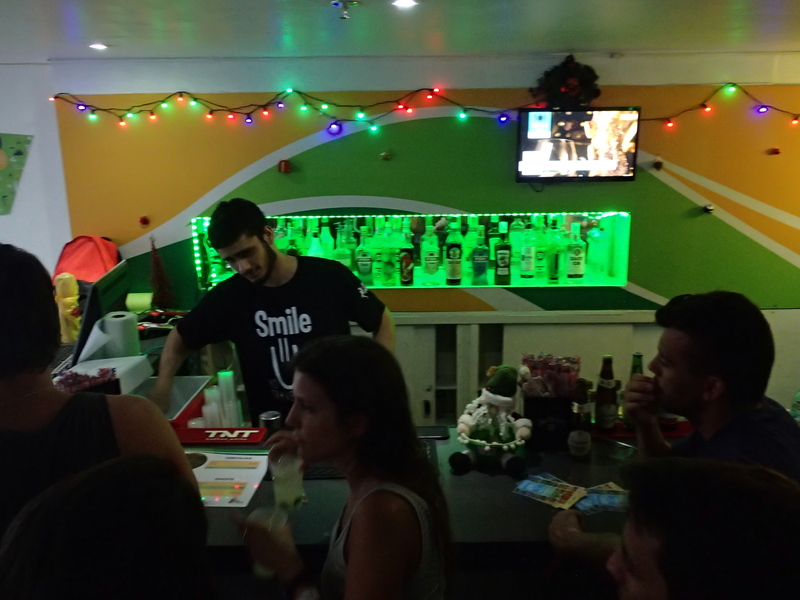 Each evening, there’s a “happy hour” where you get as many free drinks as you can down in half an hour (Caipirinhas, specifically. They’re the sugarcane-rum-based national cocktail). That, of course, is only the beginning of the party. We’re a few years older than the target demographic, so we opted for a private room rather than sharing a communal area of bunkbeds and showers that is the signature of hostel lodging. If you decide to visit, bring earplugs. And ask to see the book! Here’s the master at work. Needless to say, it’s a busy 30 minutes for the man. PS — If you so choose, in MURDERED you can end up back at your hostel on the first night and meet the bartender at this very location. Wanna come check out a friggin’ PALACE?! Yeah, me too. 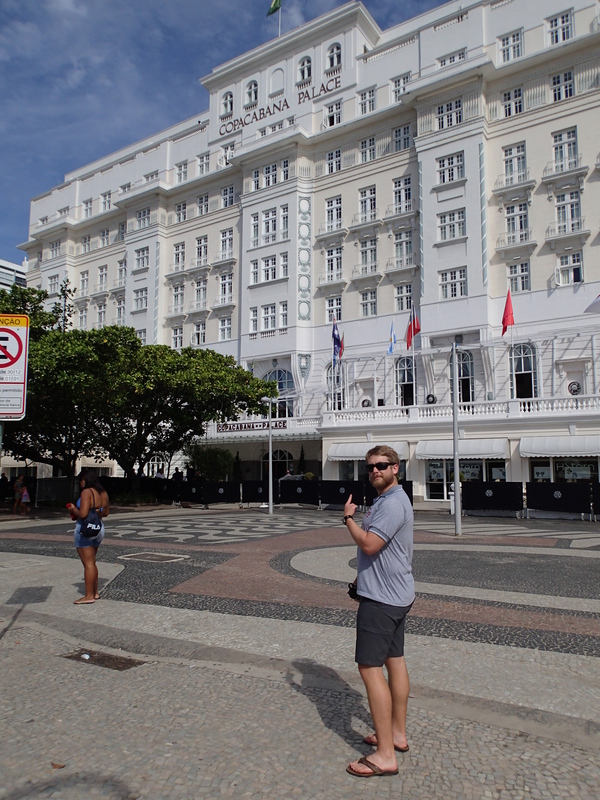 Your other lodging choice in the book is getting set up at this luxurious hotel located directly on Copacabana beach. The center-stage for the New Year’s celebration known as “Réveillon” was set up on the beach directly in front of the hotel and a private archway was constructed so guests could move to and from the party. The rates for the holiday (New Years is huge in Brazil) were higher than the already normally pricey rooms. Turns out…we didn’t actually stay here. 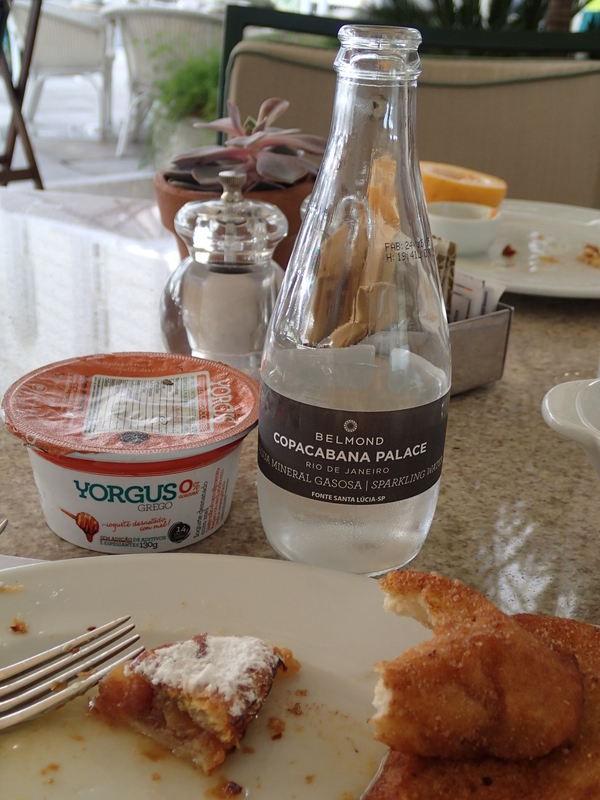 It was way too expensive for us–BUT, we did manage to come for the poolside breakfast, and if you get the chance, I would highly recommend doing so yourself. 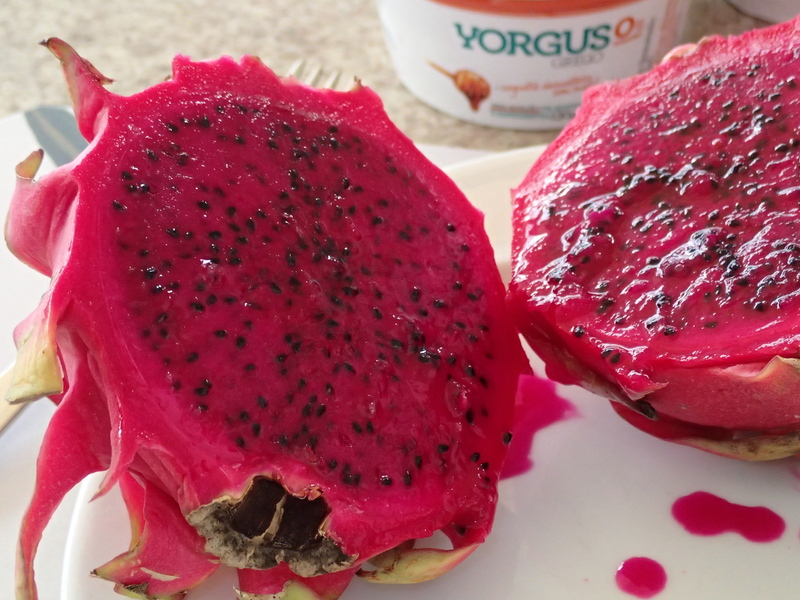 A smorgasbord of fruits, pastries, and other exotic treats awaits. If you’re able to afford it, I’d recommend you not miss this spot. 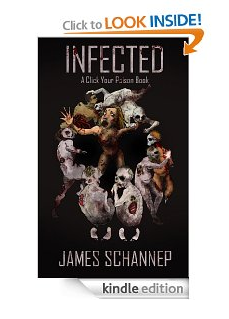 And if you stop by to visit, they have a signed book too, so ask to see it! For our final lodging, we found a diamond in the rough. And by rough, I mean we rented a spare room in an affluent neighborhood right next to the ocean. Check out this view! View from where that dude was standing. Go ahead, zoom in on that last picture. 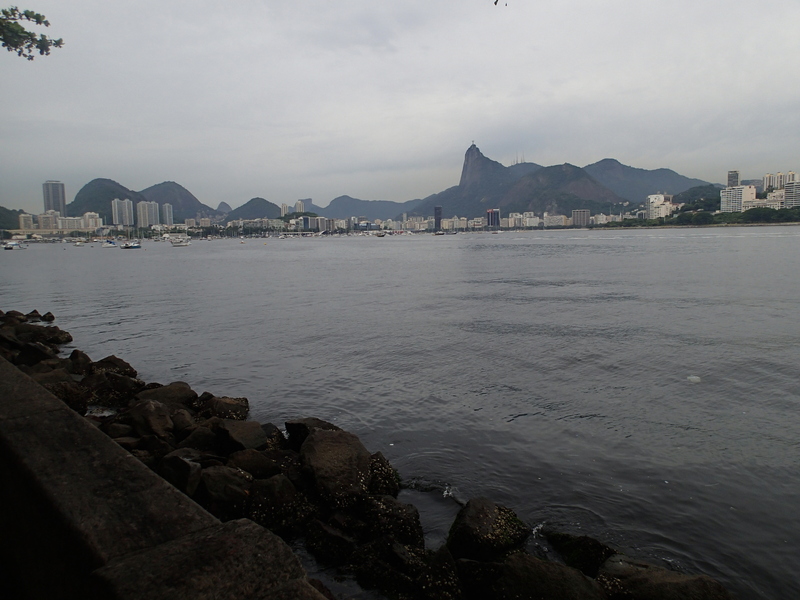 Just across the bay…it’s the iconic Christ the Redeemer statue! How amazing is that? We picked this place because it’s (a bit) out of the way, and because we could check out the other half of the city. 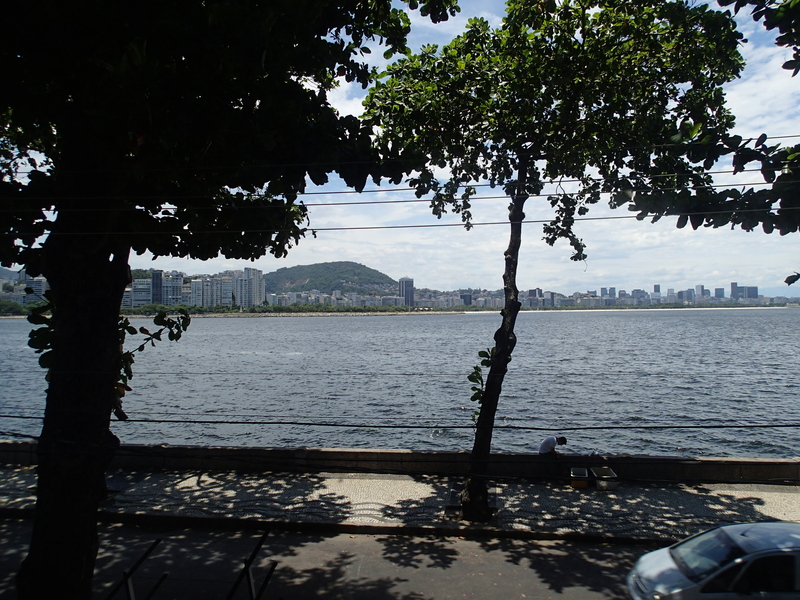 The room is called Urca with beautiful view!!! and the deal is impossible to beat. Clean, and beautiful indeed, with a great price to boot. If you go, tell Cissa we said hi! She has a copy of the book too. Thanks for reading! Where would you most want to stay? Questions for me? ← Come with me, Vamos o Brasil! Thanks, Mortiz. It was a ton of fun (and I’m just getting started blogging about the experience). When are you heading to Brazil? If you stop by the places I listed, say ‘hi’ to my book for me! Enjoy Japan! We went in 2012 and had a blast.